Mysterious cans of bugs spray have been showing up in a Boca Raton pond and people who live nearby want answers. For the last six weeks, Donald Maher said he's found cans of bug spray in the pond outside his Central Park community. 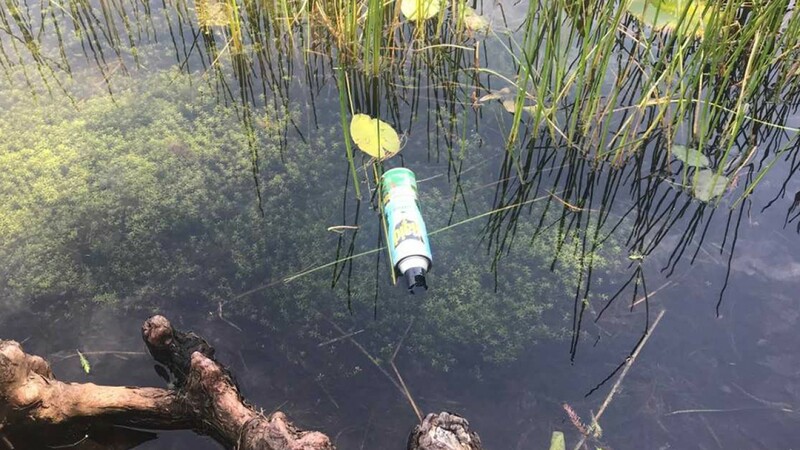 BOCA RATON, Fla. — Mysterious cans of bugs spray have been showing up in a Boca Raton pond and people who live nearby want answers. For the last six weeks, Donald Maher said he's found cans of bug spray in the pond outside his Central Park community. During the last week of February, the neighborhood was doing a community clean-up, and that was the first time he saw them. "Enough to fill up two five gallon buckets," said Maher. Since then, Maher said he's found cans every week. Sunday night he found five cans floating on the north side of the pond. Almost all of the cans had their tops removed and looked brand new. "It seems now somebody is trying to hide something they are doing by getting rid of these cans, or they are purposefully trying to put something in the water," Maher said. The pond had nearly a dozen cans while WPTV crews were walking around this week. Boca Raton police are investigating, as well as the city’s Code Enforcement department. "We take all kinds of calls and reports," said Mark Economou with Boca Raton police. "This one has to do with the environment and protecting the environment." If you have any information about who put the cans there, call the Boca Raton Police Department.